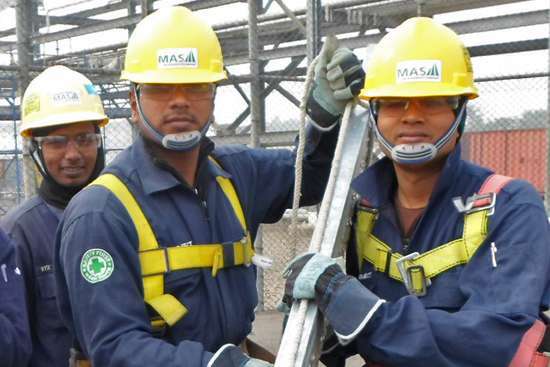 MAS is focused on training and developing people, encouraging growth and career progression. Our scaffolders are trained in-house, with the capability to service our clients to the highest standard. We also provide external training through internationally recognised RTO providers as required. We offer regular IRATA rope access courses and certification. We run our training courses for new candidates and existing technicians with the same adherence to safety and responsibility we expect from our workforce. All training is carried out by our highly experienced IRATA certified instructors, at our newly designed training facility in Bayswater, Western Australia. Click here for more information on IRATA courses and booking details. Our painting, coating and blasting courses are specifically designed for the resources and oil & gas industry. We offer a series of upskilling courses, designed to provide tradespeople and trade assistants with an awareness of the use of cryogenic insulation and application techniques.